Get an Exclusive Marvel's Agents of S.H.I.E.L.D. Poster at San Diego Comic-Con | Marvel's Agents of S.H.I.E.L.D. Marvel's Agents of S.H.I.E.L.D. fans attending San Diego Comic-Con can pick up the below exclusive poster while supplies last! 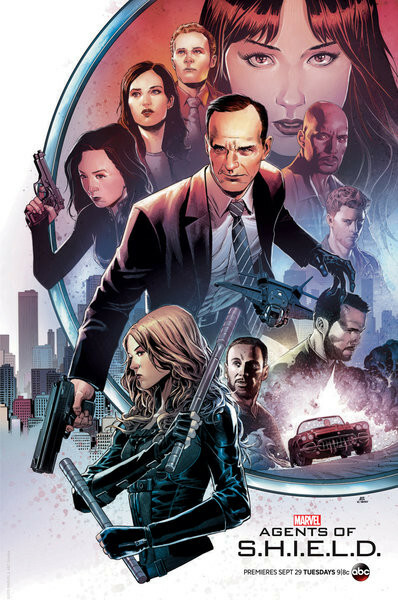 The piece, which features key Marvel's Agents of S.H.I.E.L.D. cast members like Agent Phil Coulson and Melinda May, was created by talented artist Jim Cheung and colorist Romulo Fajardo Jr.
Don’t forget to attend the world famous Marvel Television Presents panel on Friday, July 10 from 3:00 to 4:15 p.m. Marvel's head of Television Jeph Loeb will bring you exclusive news and surprises about your favorite action-packed Marvel series on ABC. Join Jeph, showrunners, and the casts of Marvel's Agents of S.H.I.E.L.D. and Marvel's Agent Carter for this must-see panel that’ll have everyone talking! On Saturday, July 11 at 2:30 p.m., you'll also have a chance to meet the Marvel's Agents of S.H.I.E.L.D. cast and executive producers for an autograph session at the Marvel Booth (#2329) on the Convention Center Floor! Autograph session attendees include actors Clark Gregg (Director Phil Coulson), Ming-Na Wen (Melinda May), Chloe Bennet (Skye), Brett Dalton (Grant Ward), Iain De Caestecker (Fitz), Elizabeth Henstridge (Simmons), Nick Blood (Lance Hunter), Adrianne Palicki, Henry Simmons and Luke Mitchell as well as executive producers Maurissa Tancharoen, Jed Whedon and Jeph Loeb. Can't wait for the season three premiere of Marvel's Agents of S.H.I.E.L.D.? We are aching to know what's next for Agent Phil Coulson and how he rebuilds his team. Marvel's Agents of S.H.I.E.L.D. returns TUE SEPT 29 9|8c! RELATED MARVEL'S AGENTS OF S.H.I.E.L.D.